Take a second to tell us how you feel about the second season of Child Support TV show on ABC. As we all know, the Nielsen ratings typically play a big role in determining whether a TV show like Child Support is cancelled or renewed for season three. Unfortunately, most of us do not live in Nielsen households. Because many viewers feel frustration when their viewing habits and opinions aren’t considered, we’d like to offer you the chance to rate all of the Child Support season two episodes here. An ABC game show hosted by Fred Savage, Child Support comes from creator Ricky Gervais. 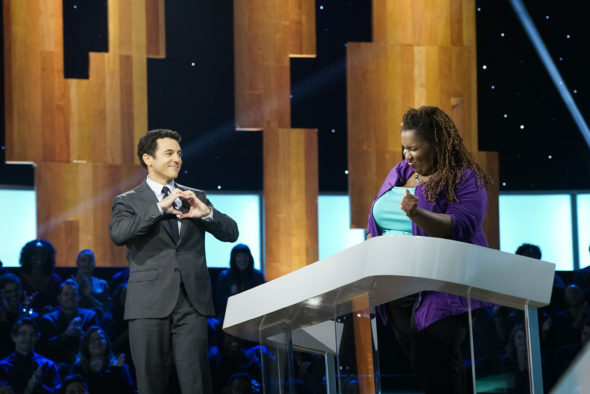 To play, adult contestants must answer ten questions correctly, in order to win the top prize of $200,000. When the grownups give the wrong answer, that’s when five cute and funny kids ride to the rescue. Gervais has asked the children the same thing. If they are able to supply the correct response, their support saves the adults. What do you think? Which season two episodes of the Child Support TV series do you rate as wonderful, terrible, or somewhere between? Should ABC cancel or renew Child Support for a third season? Don’t forget to vote, and share your thoughts, below. More about: Child Support, Child Support: canceled or renewed? WE LOVE THIS SHOW!!! IT’S VERY FUNNY AND AT THE SAME TIME VERY ENTERTAINING AND INFORMATIVE. DEFINITELY NEED MORE SHOWS LIKE THIS. PLEASE RENEW FOR SEASON 3 AND MANY MORE AFTER. Please do a season three. My Mom & I love this show! We are always in stitches watvhing the kids. Please bring it back for another season! I love this show. We needed more shows like this one. Funny, informative and entertaining. Please ABC don’t cancel it. WE LOVE THE SHOW! WE ARE WAITING FOR THE NEXT SEASON TO BEGIN! LOVE THOSE KIDS AND THEIR INTERACTION WITH RICKY! First of all it’s nice to Fred back on the small screen. The kids are really smart(especially the bow tie boy). Glad it is doing well the person (Ricky?) in with the kids is funny and has a lot fun. Love the show. Keep it going. I think it’s a great show !!! The kids are awesome the whole crew is !! Keep them going for 3rd season my whole family watches it together!! !